Although he is already a successful musician and entrepreneur, Chicago native Richard Owens has found value in putting his career on hold to get a graduate education at WSU. 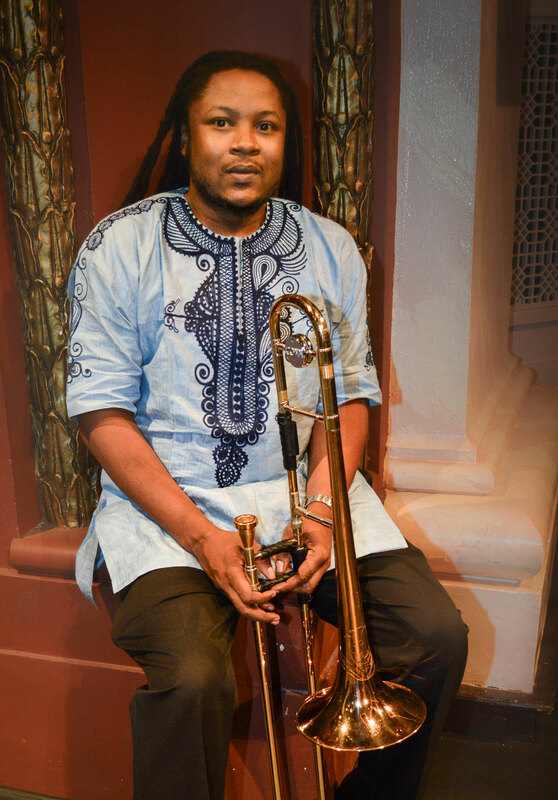 Richard has already generated a lot of buzz composing music and playing his trombone for his own record label. With dedication to music, passion for knowledge, and focus on his craft, Richard has been successfully balancing life as a musician and graduate student in the Kimbrough School of Music at WSU. Richard has been playing the trombone most of his life. His passion for music comes from his early childhood, when he recalled spending summers with his grandfather, a Korean War veteran. He would take Richard to White Castle, pull out his keyboard, and play music. Since that time, Richard knew music would always be a part of him. On Career Day in the eighth grade, a guest artist played for the class without any sheet music. Enamored by the artist’s grace and passion for the music, Richard realized that a person could actually make a living playing music. Since then, music has become Richard’s life. He’s made a decent living traveling around the world, and been fortunate enough to perform and be around high profile musicians like Dr. Joe Sample and Dr. Matthew Knowles. The late Joe Sample, who was a member of the original Jazz Crusaders, is Richard’s greatest inspiration. Richard met Knowles when he took a class from him as an undergraduate student. Knowles is a professor, talent manager, entrepreneur, and the father of Beyoncé and Solange Knowles. He taught Richard about entrepreneurship within the music industry, such as record label terminology, business terminology, album sales, and digital sales. With the help of these two men, Richard has become a successful musician. In 2014, Richard signed to GVR Records as a part of a band called The C.I.T.Y., which released an album called #StayTuned in 2015. Richard is also a part of the jazz band the RADS Krusasders II.0, which is based off Sample’s old band, The RAD Crusaders. They released an album called In Session in 2014. Along with alumnus and former professor Horace Alexander Young, Richard is featured in Donna E. Scott’s 2015 album titled, Somehow I Knew,. Most recently, Richard was featured in an advertisement in Downbeat Magazine to promote the WSU’s Jazz Studies Program. Growing up, Richard was told he would amount to nothing. He wanted to prove that theory wrong and set the expectation bar high for his family—so despite his commercial success, he decided to pursue higher education. Richard came to WSU because of the Graduate School’s Research Assistantships for Diverse Scholars (RADS) program. The purpose of the RADS program is to increase access and opportunities to graduate education for U.S. students from underrepresented communities and to increase graduate student diversity at WSU. The first thing Richard noticed about WSU was the family environment. To him, WSU is home. Another thing Richard appreciates about WSU is the vast amount of resources. “The faculty are walking resources that can guide you in the right direction,” he said. Moreover, he noted, WSU is a great place to enhance his practice as a musician with the music library and performance stage at Bryan Hall. By putting his music career on hold and focusing on his education, Richard believes he will be able to learn more than the average musician. Richard is currently finishing this master’s thesis project, which includes three compositions that incorporate West African Afrobeat, Highlife music, and American Western Jazz. His compositions are a hybrid form of jazz that incorporate improvisation and exotic percussion, as well as ethno instruments. Once he finishes his master’s, Richard will continue to work on his label he created in 2010 called Legacy Music Company, operated by he and his brother out of Houston, Texas.